With our equipment you are able to save more time. Others promise you a high output but if you look at their promotional videos and check how many seconds it takes to wrap one case, and then calculate the real speed of wrapping you will see that it is under 150-180 cases per hour. After doing that watch our video, compare the difference and realize how much time you will lose if you buy something else! Compare the price of the Speedstar Pro semiautomatic overwrapper with any comparable machines in the market. Feel the difference. No machine in the market is able to support 2 different cases without any modifications. Jewell Case and DVD Boxes can now be professionally wrapped in-house. Also you don t need to use pre-cut film sheets. 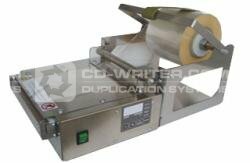 The Speedstar overwrapping machines work with standard packaging film in rolls that costs few times less per one case! This means you save money with every overwrapped case, Day by Day! "I bought this overwrapper and it is very well built from a physically speaking, very solid and professional . I haven't ever owned an overwrapper so I don't have experience with competing products but ADR's product was the most promissing so I went with his product." Jason H.
"Its a very good machine and we are very happy with it. We own a record label and have already wrapped thousands of cds with that machine.We've had the machine for about 4-5 months, and have used 3 big wrapping rolls already. I can highly recommend getting it . It's a much better alternative than the other machine where you slide the cd through the top and it's much faster than anything out there . If you want to be fast on it, it takes a little while to get familiar with the cds but once you got it, it s a walk in the park. " Eva C.
"Hi, I did purchase an overwrapper from this company and I am very happy with it. It works well and the price was much better than anything else out there . The fact that it supports both most common formats made my decision easy. I highly recommend this product. Thanks." Gabriel W.
SpeedStar . Pro . CD . Jewell . Case . - . DVD . Box . Overwrapper . ADR . AG .